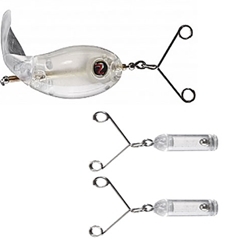 Upgrade and change the sound of any hollow body frog with the River2Sea Phat Frog Kit. The two rattles and one plopper tail included in the kit gives anglers the option to add different sounds to their frog and change up their presentation. The stainless steel wire construction provides increased durability and strength, and the clear chambers can be colored or dyed to compliment any frog. Simply attach the stainless steel wire loops to the double frog hook and you are ready for some exciting topwater action with the River2Sea Phat Frog Kit.